Earlier today, Breakpoint Studio released a brand new gameplay trailer for their upcoming Tennis World Tour game, this time showing off two of the games biggest legends, André Agassi and John McEnroe, taking each other on. This recent gameplay reveal also comes with the announcement that a Legends Edition of the upcoming game is available for fans to preorder now. Players who preorder the game’s Standard Edition won’t miss out on some goodies either, though, as Standard preorders will also award players with André Agassi as a playable character alongside his 1995 outfit. In Tennis World Tour’s Career mode, your main goal with your avatar is to become the best in the entire world. To do that, you’ll have to learn to manage both your schedule and your form. Take part in an exhibition match or a tournament, train or rest — your choices are crucial and will have an impact on your career. If you string multiple matches together, or travel relentlessly around the globe, fatigue will sneak up on you, your performance will be affected, and you risk injuring yourself. The best strategy? Find the right balance; win tournaments, and win credits to hire staff, buy equipment, and pay the entry fees to ever more prestigious tournaments. 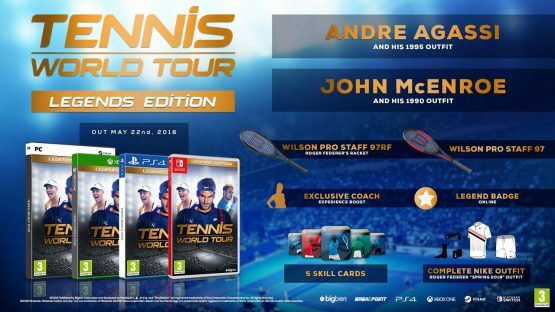 Tennis World Tour will release on May 22, 2018 for PlayStation 4, Xbox One, Nintendo Switch, and PC.